Tūī – Probably the most well-known of the New Zealand birds is the tūī. Tūī are nectivorous meaning they feed mainly on nectar from the flowers of native plants such as kōwhai, pūriri, pōhutukawa and flax. Tūī are important pollinators of many native plants. Their beautiful songs can be heard throughout most of New Zealand as tūī are found on each of New Zealand’s mainland islands. Tūī are easily recognised by the white tuft under their throats. At first glance their bodies may seem dark in colour, but up close you will see tūī feathers have an array of colours like green, blue, brown and purple. Tūī can be aggressive toward other birds and you will often see them chasing birds away from their favourite food sources. 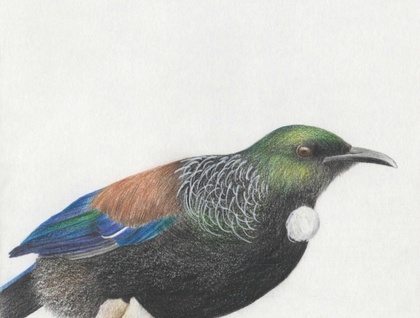 Head to www.doc.govt.nz to learn more about these covertly colourful birds!